The prime die state has a total known population of 5 examples with a pair of XF's leading the pack. 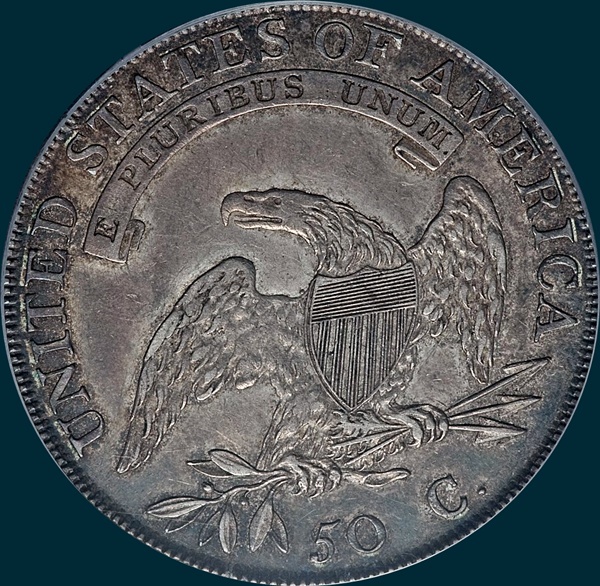 Both the 'a' and 'b' die states are very rare and sought after by the variety collectors. 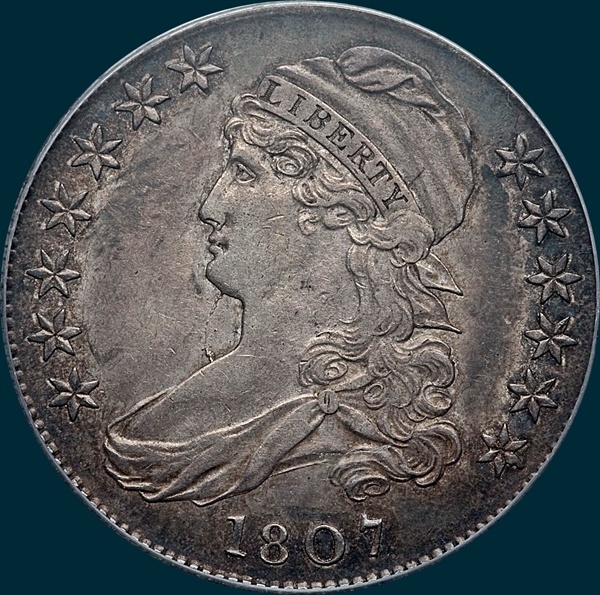 The 'a' die state is less common than the heavily cracked 'b' die state with a group of AU examples heading up each state, and no MS coins currently known to exist. 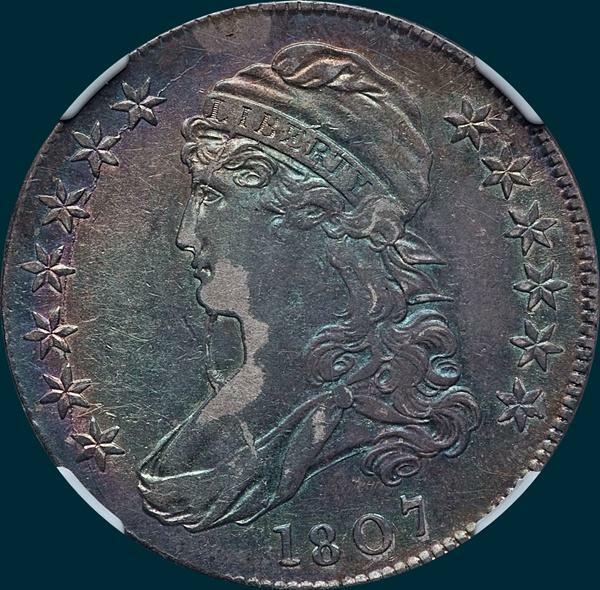 In order obtain one of this marriage in a decent problem free grade, the wallet will need to be opened as the premium over the O-112 is quite large. Variety Attribution, O-111 Prime R7? 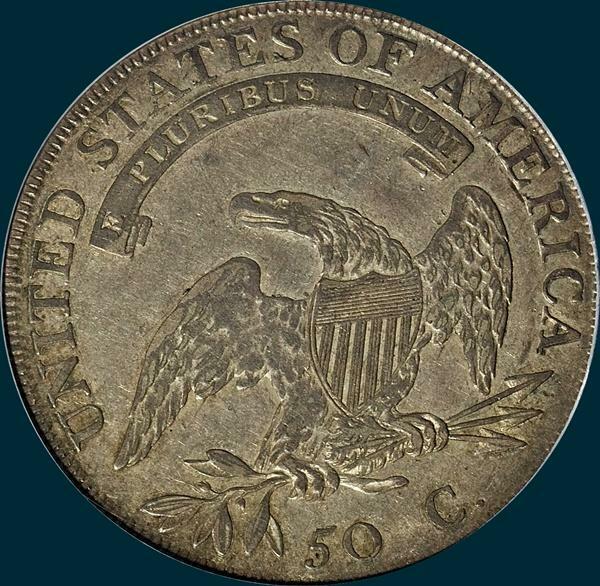 : Obverse-Stars large and well formed. Date is 8 mm. and small, well centered, and evenly spaced. 1 has a long pointed serif at top, but hardly any at lower left. Top of B in LIBERTY is unfinished and bottoms of letters are ribbed. O-111a R5: A light curvng crack from upper chest to under side of chin, usually showing a small lump at juncture with chest. Another crack from milling opposite end of bust proceeds upward to join all stars on left to edge above cap. This crack is usually sharp from star 1 to star 5, with a small lump near the latter, but very fine at both upper and lower ends. O-111b R5 (Bearded Goddess): Crack from chest to chin has become a heavy break, forming a solid lump just above chest and extending in lighter cracks up along nose and across eye to headband and down across curls, headband at E and into cap. Reverse-50 over inverted 5. 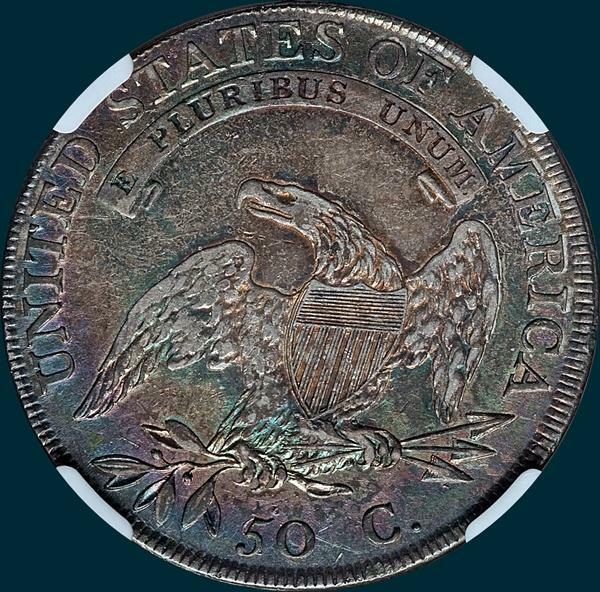 50 C. is 2 3/4 mm. Arrow to A is 1 mm. Center dot near junction of left wing and shield and a sharp die defect dot below the lowest arrowhead. Arrowheads are ribbed and show recutting. In this second use of H, the base of 5 fragment is very weak. 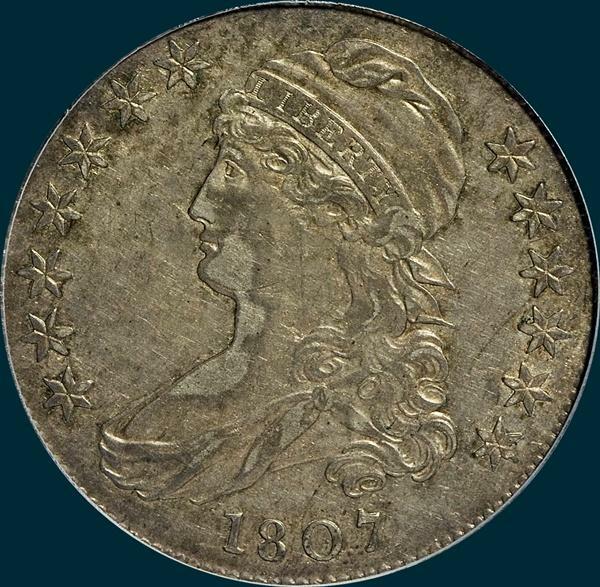 This was the 3th variety of Capped Bust Half Dollar minted in 1807 and overall.